For other uses, see Vicuña (disambiguation). The vicuña (Vicugna vicugna) or vicuna (both /vɪˈkuːnjə/, very rarely spelled vicugna, which is actually the name of its genus) is one of the two wild South American camelids which live in the high alpine areas of the Andes, the other being the guanaco. It is a relative of the llama, and is now believed to be the wild ancestor of domesticated alpacas, which are raised for their coats. Vicuñas produce small amounts of extremely fine wool, which is very expensive because the animal can only be shorn every three years, and has to be caught from the wild. When knitted together, the product of the vicuña's wool is very soft and warm. The Inca valued vicuñas highly for their wool, and it was against the law for anyone but royalty to wear vicuña garments; today the vicuña is the national animal of Peru and appears in the Peruvian coat of arms. The vicuña is considered more delicate and graceful than the guanaco, and smaller. A key distinguishing element of morphology is the better-developed incisor roots for the guanaco. The vicuña's long, woolly coat is tawny brown on the back, whereas the hair on the throat and chest is white and quite long. The head is slightly shorter than the guanaco's and the ears are slightly longer. The length of head and body ranges from 1.45 to 1.60 m (about 5 ft); shoulder height is from 75 to 85 cm (around 3 ft); its weight is from 35 to 65 kg (under 150 lb). To prevent poaching, a round-up is held every year, and all vicuñas with fur longer than 2.5 cm are shorn. Vicuñas are native to the central Andes in South America, where found in Peru, northwestern Argentina, Bolivia, and northern Chile. A smaller, introduced population lives in central Ecuador. 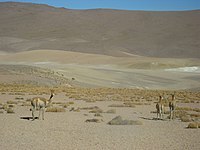 Vicuñas live at altitudes of 3,200 to 4,800 m (10,500–15,700 ft). They feed in daytime on the grassy plains of the Andes Mountains, but spend the nights on the slopes. In these areas, only nutrient-poor, tough, bunch grasses and Festuca grow. The sun's rays are able to penetrate the thin atmosphere, producing relatively warm temperatures during the day; however, the temperatures drop to freezing at night. The vicuña's thick but soft coat is a special adaptation which traps layers of warm air close to its body, so it can tolerate freezing temperatures. Herd of vicuñas near Arequipa, Peru. The behavior of vicuñas is similar to that of the guanacos. They are very shy animals, and are easily aroused by intruders, due, among other things, to their extraordinary hearing. Like the guanacos, they frequently lick calcareous stones and rocks, which are rich in salt, and also drink salt water. Their diets consist mainly of low grasses which grow in clumps on the ground. Mating usually occurs in March–April, and after a gestation period of about 11 months, the female gives birth to a single fawn, which is nursed for about 10 months. The fawn becomes independent at about 12 to 18 months old. Young males form bachelor groups and the young females search for a sorority to join. This deters intraspecific competition and inbreeding. From the period of Spanish conquest to 1964, hunting of the vicuña was unrestricted, which reduced its numbers to only 6,000 in the 1960s. As a result, the species was declared endangered in 1974, and its status prohibited the trade of vicuña wool. In Peru, during 1964–1966, the Servicio Forestal y de Caza in cooperation with the US Peace Corps, Nature Conservancy, World Wildlife Fund, and the National Agrarian University of La Molina established a nature conservatory for the vicuña called the Pampa Galeras – Barbara D'Achille in Lucanas Province, Ayacucho. During that time, a game warden academy was held in Nazca, where eight men from Peru and six from Bolivia were trained to protect the vicuña from poaching. The estimated population in Peru increased from 6,000 to 75,000 with protection by game wardens. Currently, the community of Lucanas conducts a chaccu (herding, capturing, and shearing) on the reserve each year to harvest the wool, organized by the National Council for South American Camelids (CONACS). The wool is sold on the world market for over $300 per kg, to help support the community. In Bolivia, the Ulla Ulla National Reserve was founded in 1977 partly as a sanctuary for the species. Their numbers grew to 125,000 in Peru, Chile, Argentina, and Bolivia. Since this was a ready "cash crop" for community members, the countries relaxed regulations on vicuña wool in 1993, enabling its trade once again. While the population levels have recovered to a healthy level, poaching remains a constant threat, as do habitat loss and other threats. 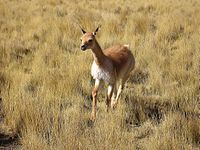 Consequently, the IUCN still supports active conservation programs to protect vicuñas, though they lowered their status to least concern. The US Fish and Wildlife Service has reclassified most populations as threatened, but still lists Ecuador's population as endangered. The wool is popular due to its warmth. Its properties come from the tiny scales on the hollow, air-filled fibres. It causes them to interlock and trap insulating air. Vicuñas have some of the finest fibers in the world, at a diameter of 12 μm. The fiber of cashmere goats is 14 to 19 μm, while angora rabbit is 8 to 12 μm and that of shahtoosh from the Tibetan antelope, or chiru, is from 9 to 12 μm. Since it is sensitive to chemical treatment, the wool is usually left in its natural color. The vicuña only produces about 0.5 kg (1.1 lb) of wool a year, and gathering it requires a certain process. During the time of the Incas, vicuña wool was gathered by means of communal efforts called chacu, in which multitudes of people herded hundreds of thousands of vicuña into previously laid funnel traps. The animals were shorn and then released; this was only done once every four years. The vicuña was believed to be the reincarnation of a beautiful young maiden who received a coat of pure gold once she consented to the advances of an old, ugly king. Because of this, it was against the law for anyone to kill a vicuña or wear its fleece, except for Inca royalty. At present, the Peruvian government has a labeling system that identifies all garments that have been created through a government-sanctioned chacu. This guarantees that the animal was captured, shorn alive, returned to the wild, and cannot be shorn again for another two years. The program also ensures that a large portion of the profits return to the villagers. However, annually, up to 22,500 kg of vicuña wool are exported as a result of illegal activities. Because of this, some countries have banned the importation of the wool to save the animal. There is a limited but growing trend to commercially produce wool from vicuñas in captivity, with growing herds in the Chilean Andes. Biologist Cristian Bonacic has expressed his concern about the possibility of habitat damage and the transmission of disease in the farms. As of June 2007, prices for vicuña fabrics can range from US$1,800 to US$3,000 per yard. Vicuña wool can be used for apparel (such as socks, sweaters, accessories, shawls, coats, and suits) and home furnishings (such as blankets and throws). A vicuña wool scarf costs around US$1,500. A vicuña sport coat from the Italian tailoring house Kiton costs at least US$21,000. ^ a b c d e Baldi, R. & Wheeler, J. (2008). "Vicugna vicugna". IUCN Red List of Threatened Species. Version 2008. International Union for Conservation of Nature. Retrieved 3 January 2009. ^ Hogan, C. Michael (7 December 2008). Strömberg, N. (ed.). "Guanaco: Lama guanicoe". GlobalTwitcher.com. GlobalTwitcher. Archived from the original on 4 March 2011. ^ Schuhmacher, Eugen (1 January 1968). The last of the wild: on the track of rare animals. Collins. p. 304. ^ "Species Profile: Vicuna (Vicugna vicugna)". U.S. Fish and Wildlife Service. Archived from the original on 1 February 2009. Retrieved 4 January 2009. ^ Roberson, Mary-Russell (January – February 2008). "Discovering South America's Camels". Smithsonian Zoogoer. National Zoological Park, Smithsonian Institution, Washington, DC, USA: Friends of the National Zoo. Archived from the original on 21 March 2008. Retrieved 16 May 2010. ^ Bonacic, Cristian; Gimpel, Jessica (1 January 2003). Lemons, John; Victor, Reginald; Schaffer, Daniel (eds.). Sustainable Use of the Vicuña: A Critical Analysis and the MACS Project. Springer US. p. 348. doi:10.1007/978-1-4615-0375-0_24. ISBN 978-1-4613-5045-3. ^ Coggins, David (20 September 2013). "Why Does a Vicuña Jacket Cost $21,000?". Wall Street Journal. Viva Vicuña, documentary film about Vicuñas in the Andes. Light & Shadow. 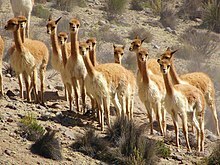 "The Vicuna: the precious treasure of the Andes". Alpaca Fiber News. Archived from the original on 21 October 2009. Bayly Letts, Andres; Pasquel Rodríguez, Enrique (Summer 2006). "Privaticemos las vicuñas: Cómo Eliminar el Peligro de Extinción y Aprovechar su Potencial Económico" [Privatize the vicunas: How to Eliminate the Danger of Extinction and Take Advantage of its Economic Potential] (PDF). Revista de Economía y Derecho (in Spanish). 3 (9): 69–80. Archived from the original (PDF) on 24 March 2009.